On May 20th, Prince Philipp and Prince Michael were in attendance at the 12th annual International Gottfried von Haberler Conference at the University of Liechtenstein in Vaduz. 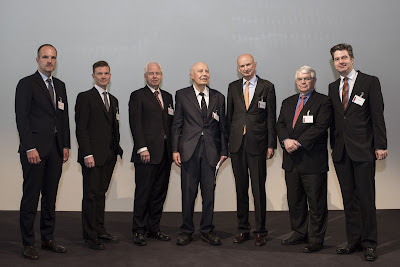 The event, organized into three sessions, was focused around the theme "Über Zentralbanken, Schuldenpolitik und den geprellten Bürger" ("Central Banks, Fiscal Policy and the Betrayed Citizen"). Prince Michael gave the opening address and the farewell address. The annual conference is organized by ECAEF, or the European Center of Austrian Economics Foundation. More about the conference here and here, as well as a video here. For previous blog posts about the Haberler conference, see here, here, and here on the blog. UPDATE: It turns out that Prince Hans-Adam and Prince Nikolaus were also at the conference.